Are we using Study Halls effectively? My school has an addiction to study halls. They are used to pad out the master schedule for students in our middle school. By the time they get to grade 11, our students might even have half a day in study hall. Unfortunately, value of this self-directed time is unclear. In spite of a school policy that requires students either do classwork or read a book, students often spend their study hall time watching videos, chatting with friends, and neglecting their schoolwork. Policing study halls is difficult for the monitors because the students see study hall as “their” time, and resent being told what to do. Fully On-Task: The student is currently working on an assignment and clearly focused on his/her task. If the student is working with a peer, their discussion must be tightly bound to their assignment. Distracted: The student has work out, but is not fully focused on the task. Distractions include chatting with peers or teachers, viewing non-task-related material on a computer, and using a phone. No Work: There is no evidence of the student attempting to work on a school assignment during this period. Figure 1: Student work in study halls over a three-week period. 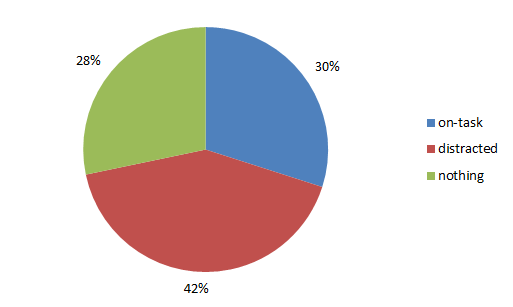 The pie chart above depicts how students used the study halls during this investigation. Each student in each study hall is counted equally. To compile and compare the data, I calculated a quantity called fractional studiousness, as follows. Fractional studiousness is a measure of the usefulness of a study hall period. My colleague suggested that the students often arrive on Monday with their homework completed and that they do little on Friday because due dates are several days away. I’d add that, on occasion, students have assignment deadlines extended until the end of the day on Friday — this might explain the large variability in studiousness on that day. Figure 2 shows a classic depiction of the “hump”-shaped workweek. Figure 2: How studious are study halls over the course of a week? I was also curious about how students performed in their study halls over the course of a day. In figure 3, you can see lower performance in the afternoon, perhaps attributable to post-lunch sleepiness. There’s also a hint of lazy mornings. Figure 3: Studiousness over the course of a school day. Breaks are indicated in red. Another way to slice these data is to isolate the worst study hall blocks. In this study, there were 12 worst study halls that have a studiousness of 0.4 or less. All the others have a studiousness of at least 0.5. Note that some of the data points in figures 3 and 4 coincide. 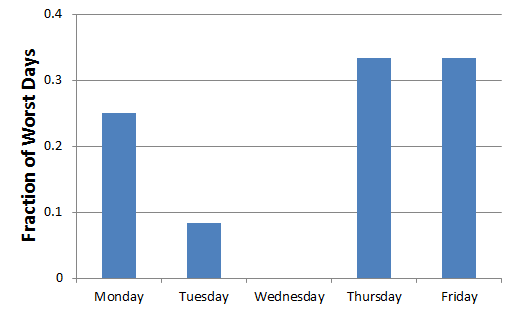 Figure 4: Distribution of the worst study hall periods during the course of the week. In the week-long view, the trend toward a mid-week efficiency “hump” is retained. The day-long graph shows ineffective mornings, and mid-afternoon blahs. 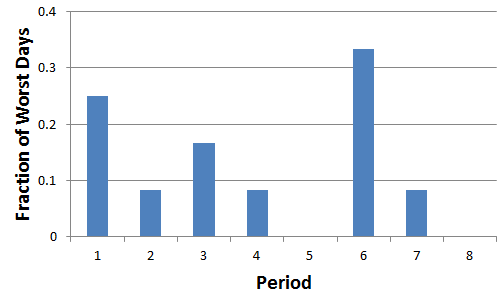 Figure 5: Distribution of the worst study hall periods during the course of the day. I was also curious about the role of technology in studiousness during study halls. Naively, one might suggest that computers offer students a plethora of ways to be distracted. For the purpose of this study, I counted laptop computers and tablets (iPad, etc) but not smartphones (iPhone). My belief is that the former is typically viewed as a tool (for writing essays, researching, reading electronic texts, etc) while the latter is typically viewed as a communication and entertainment device. Figure 6 shows comparisons of the same study hall on two different weeks. This should offer a control against the studiousness of individual students. 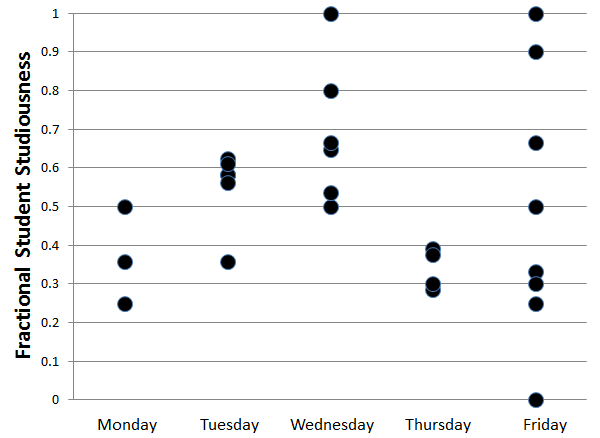 For example, the red line shows a particular group of students had a studiousness of 0.5 on a week when 20% had computers, and a lower studiousness of 0.2 on a week when 50% had computers. In this case, we can infer that more computers means more distraction. 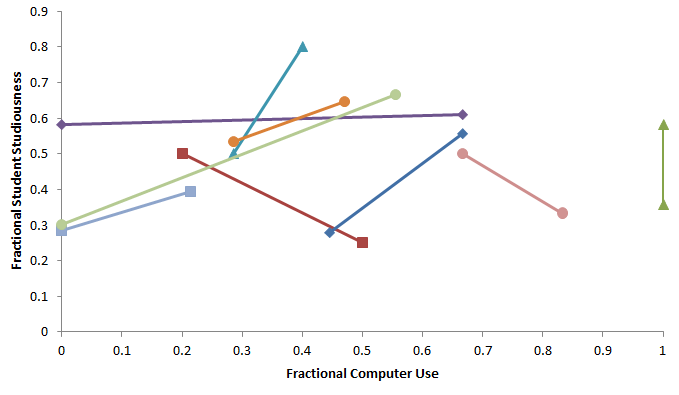 Figure 6: How does computer use affect studiousness? However, the overall trend is the opposite: of the 9 study halls for which I was able to obtain data, 6 show a positive correlation between computer use and studiousness (and 1 is agnostic). In other words, more computers means more students working. The two exceptional study halls are populated primarily by a small group of 11th-grade students new to our school. This phenomenon can be explained by the fact that much of the students’ work requires the use of computers. When students don’t have computers available, they allow themselves to become distracted by other factors, such as their phones or chatting with others. Study hall time is being used effectively only 30% of the time. 28% of study hall periods are used for non-academic purposes. Distractions are a key problem for study halls. 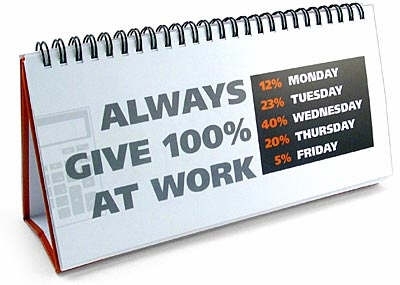 The midweek is used more efficiently than Monday and Thursday. Friday is used effectively by some students, perhaps because of end-of-week deadlines. Study halls are more productive in the morning. Block 6 (also called block 3B at our school) is particularly ineffective. Generally, computer use in study halls correlates with improved studiousness. To improve the usefulness of study halls, the school should ensure students have computers available for use during study hall periods. This entry was posted in Uncategorized and tagged education, engagement, ISL, study, study halls on October 4, 2013 by Danny. The most interesting part of this, from my perspective, is how the burndown chart provides a clear picture of the team’s progress. Could I do something similar with student assessment? It turns out that Google Apps for Education [GAFE] allows you to do this, although not easily. I started by creating a Form containing questions lifted from, and inspired by, the IB Physics course guide (ie: my content standards). The example below is a knowledge question; other questions required that students applied their understanding of concepts or employed formulae. Notice that I put a “100% wrong” bar at the start of the chart, for the sake of comparison. The 18th of September is empty because the student got all the questions correct. Since I have to create a spreadsheet and a page for each student, this method doesn’t scale. I could use a script to automate the spreadsheet work, but (probably correctly!) Google doesn’t allow automated website creation on Sites. Once the students have seen the same question a couple of times, their understanding is no longer being evaluated effectively. Knowledge-based questions seem to hold up better (after all, the point is being able to answer such a question correctly) but have limited educational value. 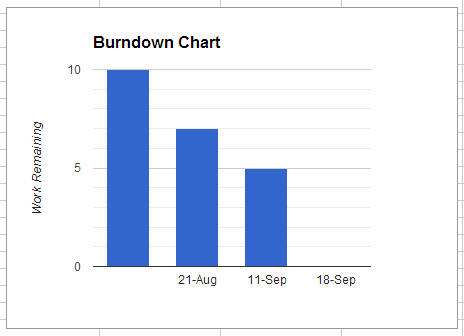 The Scrum method uses remaining man-hours as the value on the y-axis of these burndown charts. Knowledge/understanding, however, surely is not linearly related to the amount of time spent learning. Thus, a key insight to be gained from these charts — the ability to estimate a completion date — is lost. Perhaps unsurprisingly to those who are familiar with GAFE, this system hiccups. One day, the scores weren’t (automatically!) saved from the Form into the Spreadsheet for several hours. Students who are logged into personal Gmail accounts (in addition to their school GAFE accounts) experience bizarre and unpredictable errors. 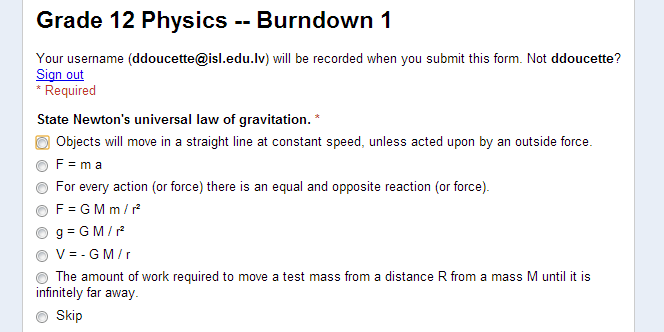 To see my full burndown quizzes (if they’re still online), check out my physics and maths class web sites. This entry was posted in Uncategorized and tagged agile development, burndown chart, education, ISL, new ideas, scrum on September 27, 2013 by Danny. Lately, I’ve been concerned about my students’ engagement at school. To understand what their day is really like, I decided to attend school for a day as if I were a student. As a teacher of two subjects (physics and math), I am free to spend most of my time thinking in the characteristic ways of those subjects. Students, on the other hand, are bombarded with ideas from diverse disciplines. I had classes in economics, philosophy, physics, and history. Each class had its own set of perspectives, contexts, background information, vocabulary, and procedures. In each classroom, I was expected to internalize a “chunk” of new ideas. Unfortunately, the mind doesn’t work like that. For example, I was still ruminating on some ideas from economics when I was supposed to be working on an essay in philosophy. Not only did this disturb my focus, but I was unable to “go deep” with my thinking because I still had mental loose ends from the previous class. There are four conclusions to be drawn from this. First, teachers shouldn’t be disheartened if they start a period and the class seems to have had their memories of earlier learning erased. In all likelihood, they are simply coming off a cognitively challenging lesson, and it will take a few minutes to re-orient. Second, teachers should ensure they build off the students’ background knowledge. This will make it easier for students to build a robust gestalt in each subject area. Likewise, explicit references to background knowledge will help students locate themselves in the appropriate context as the lesson begins. Third, collaboration between subject areas may help students transfer perspectives between disciplines, which would ease re-orientation. Fourth, the administration should attempt to maximize the number of 1.5-hour “full blocks” when drawing up the schedule for high school students. As you can see, I spent approximately 30 minutes (out of 7 hours) on my feet, and the rest of the time sitting. I sometimes found myself getting sleepy because I was stationary for so long (especially in the morning), and getting fidgety because the chairs were uncomfortable (especially in the afternoon). Physical growth during adolescence means more aches and discomfort as young bodies adapt to larger bones, so surely the students have it worse than I did. Two years ago, I bought a set of seat cushions for my classroom, but due to some reorganization, I’m now floating between classrooms (and the cushions have magically vanished). The cushions aren’t significantly more comfortable, but I think they might have made a difference after a few hours. It will be hard, but I’m going to try to incorporate more physical activity in my classes. I think that moving around and getting the blood flowing is the only way to keep student minds alert and primed. Our school has a 5 minute morning recess, a 40 minute lunch break, and a 15 minute afternoon recess. The lunch break seemed like it was long enough for me to eat, relax, catch my breath, and reflect just a bit on the day. The afternoon break allowed me enough time to get some fresh air and re-orient (see point 1 above). Students often complain about being hungry during the morning or afternoon breaks. At both of those times, it seemed like there was enough time to eat a snack. I am usually a ravenous person (I haven’t yet lost my teenage hunger) but between a moderate breakfast and a solid lunch, I wasn’t hungry at any point during the day. As a teacher, I’ve always known that lecturing is ineffective. My student day crystallized that conclusion. Although I tried my best to follow along and take notes, I could rarely get myself invested in what the teacher was saying when s/he was addressing the whole class. On the other hand, when I had to directly interact with one or two other people, there was no opportunity for “checking out” — if I was to be in the conversation, I would have to keep up and contribute. The difficulty is getting groups to function effectively. I’m certainly going to try harder to make that happen. There are three students in our 12th-grade class who don’t have functioning laptop computers. They are at a significant disadvantage because many of the classes required that students use a computer to do their work. The school has a few (poorly functioning) laptops that can be borrowed, but these are in sufficiently high demand that they are difficult to get. As a fellow student, I was able to see the difficulty and exasperation involved in trying to get these things to work. I don’t know how, but we’ve got to get computers into the hands of those students who don’t have them. For modern students in a contemporary school, it’s simply impossible to operate effectively without that invaluable tool. My last point is partly a reflection on life as a teacher. As I traveled from one classroom to another, I was frequently beset by fellow teachers and students who needed help with one thing or the other. Few of these discussions were overly deep or involved, but they involved the transfer of a small amount of vital information. The result of these quick chats was that I was late for three of my eight classes. Embarrassing! At our school we have little tolerance for lateness of any form. I think that I’m going to be a little more willing to listen to my students’ excuses for being late in the future. Thanks to M, G, & L for letting me join their (fantastic!) classes. This entry was posted in Uncategorized and tagged education, engagement, ISL, student-centered learning, study on September 20, 2013 by Danny.